Alison Kate is a yoga and meditation teacher and healthy lifestyle coach, using a holistic approaching to mind, body, and spiritual healing and wellness. Alison Kate began her journey into yoga and alternative health 13 years ago while studying with an Ayurvedic practitioner. Very quickly yoga transformed her life – becoming more physically connected and loving towards her body, calming mind chatter and anxiety, and discovering herself more deeply. Alison’s yoga classes are designed to inspire students to feel capable, empowered, and connected to their bodies. Her Vinyasa Flow classes include energetic, creative, and dynamic sequencing with breath and alignment awareness, accessible challenges, and mindfulness practices. 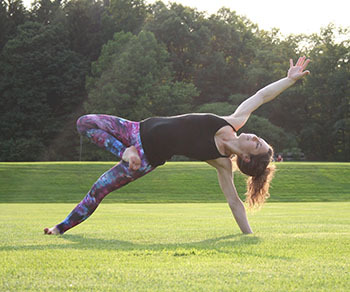 She has studied with various Massachusetts and NYC yoga teachers and mentors, and completed her 200-hour yoga teacher training in Embodyoga with Patty Townsend in 2013. Alison also teaches restorative yoga, yin yoga, and meditation. Her intention is to inspire people to feel more happy, free, energetic, and healthy.